This one-of-a-kind collection of graphics and stories reveals all the particulars behind the making of now-legendary album art including Slayer’s Hell Awaits, Judas Priest’s Screaming For Vengeance, Morbid Angel’s Altars Of Madness, Metallica’s Death Magnetic, Black Sabbath’s Heaven And Hell, Queensrÿche’s Operation: Mindcrime, Emperor’s In The Nightside Eclipse, Death’s The Sound Of Perseverance, Type Of Negative’s Bloody Kisses, Carcass’ Surgical Steel, Amorphis’ Tales From The Thousand Lakes, Soulfly’s Archangel, Behemoth’s The Satanist, Opeth’s Sorceress, and many others. 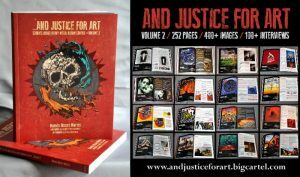 …AND JUSTICE FOR ART – VOLUME 2 was funded through a successful crowdfunding campaign launched by Oscuro via Indiegogo. The current edition is limited to 300 copies and is exclusively available at THIS LOCATION. Each copy is personally signed by the author. View the book’s teaser video at THIS LOCATION.